Cherry Mobile is set to launch tons of new devices as part of their Summer G8 Away Festival 2017, and one of the most interesting units we saw is the Flare P1, the most affordable smartphone equipped with dual rear cameras. 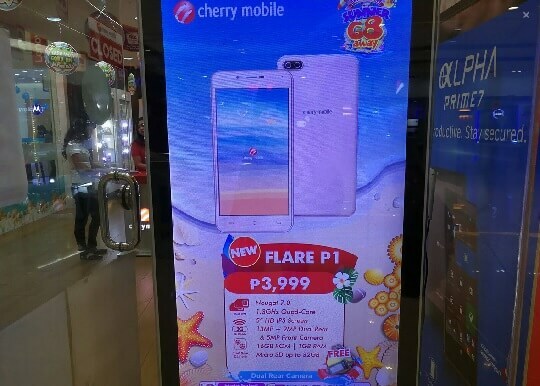 There is still limited information about the Cherry Mobile Flare P1, but according to the digital signage in one of their concept stores, it comes with 13MP + 2MP cameras on its back. And, with an asking price of just Php3,999, it becomes the most affordable handset to have that kind of feature. Running down through the usual spec sheet, it sports a 5-inch HD IPS display powered by 1.3GHz quad core processor paired with 1GB of RAM and 16GB of expandable storage. The other highlights of the phone that we know so far are dual SIM capability with 3G connectivity, 5MP front snapper, and runs on the latest Android 7.0 Nougat. As of the time of posting, we still have no idea when it will be released, hopefully it won't suffer the same fate of other Cherry Mobile devices that were announced but never sees the light of the day.